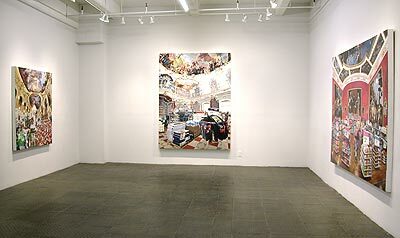 Jean Lowe’s exhibition questions the ubiquitous and powerful effects of consumerism and incessant consumption. The medium- and large-scaled paintings were inspired in part by trips to Germany, Austria, the Czech Republic, France and Switzerland. 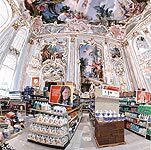 With a deft painterly hand, Lowe conflates High Baroque palaces and cloistered library interiors with the lowbrow sales floors of big-box stores. The dizzying perspectives of her amalgamated spaces, along with the cultural and temporal clashes, produce both jarring and compelling effects. 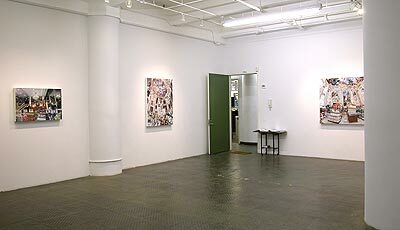 Especially with the large-scale works in the exhibition, the paintings can be read as imaginary installations by the artist. Lowe’s hybrid interiors vacillate between the lofty and the quotidian, between the aesthetic excesses of the historically elite and the bland appeal of throwaway consumer fetishes. 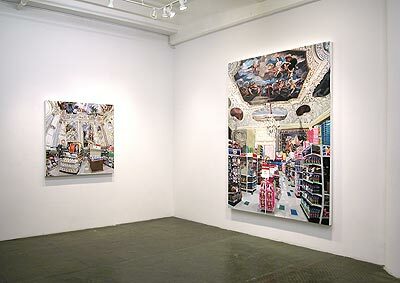 Under soaring, ornate architectural details and sumptuously painted ceilings, aisle after aisle of products recede from the viewer: stacks of electronics, racks of clothing, shelves of detergents and toys. 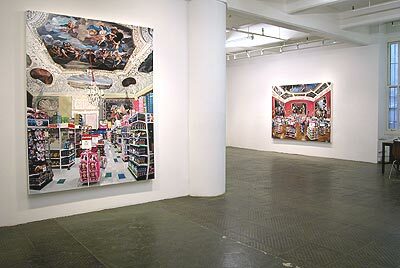 Throughout these works, Lowe includes the retail signage meant to entice buyers, with “Closeout Priced”, “2 for $4” and the garish ‘smiley face’ standing in stark contrast to background murals depicting royalty, frolicking cherubs and biblical scenes. 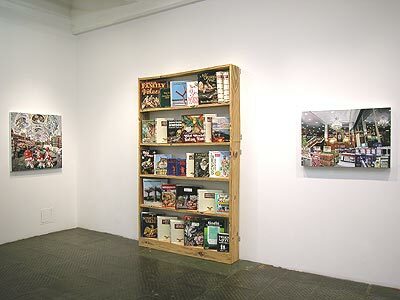 In conjunction with the imposing paintings, the show includes the papier-mâché books for which Lowe is known. Her overall intention is to suggest the repurposing of cultural ideas and architecture that once served to convey social and economic power. Lowe considers the florid decoration of the Baroque period to be a visual statement about the aspirations of its patrons. The consumer products we purchase today can similarly be said to describe who we think we are and hope to become.